It is essential we understand how the spiritual works, especially the process of producing a change in the natural world. The results from the power of God are sometimes immediate, and at other times they might have a lag time before they produce a result. I will begin with a very concise discussion of what I call the “physiology of faith,” that is how faith works. Faith begins with the Word of God. When God speaks, what He says comes into being in the spiritual realm. In Rom. 4:18, He spoke to Abraham and said He has already made him a father of many nations. But Abraham was childless when God said that to him. However, in the spirit realm, he was already made a father of many children by God. Once the Word is spoken, the next phase is that a man or woman believes that Word. Whenever we believe, we RECEIVE what God has already spoken. 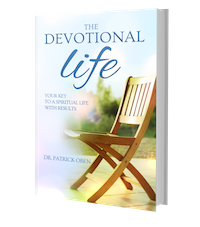 This is the most important practical line in this devotional for you to understand. You receive from God the moment your heart believes the Word. You may not see immediate physical changes, but your spirit has received from God, and it is now yours. Physical manifestation can be immediate, or it may take a while. The time difference between your believing and receiving in your spirit and seeing the physical manifestation is what I call the “latent period of faith”. This is where the faith of many of us gets crushed. We believe, and do not see an immediate change and then give up thinking nothing has happened. This is how many people lose their miracles and do not even know it. The Bible says that Abraham did not stagger in faith during his latency period. He did not change his mind while staring at barren Sarah every day, but he stood on the Word that was spoken to him from God. Satan knows that many of us do not see the spiritual and he quickly brings contrary evidence to makes us throw off our miracles. Why do you think the symptoms of a disease sometimes get worse just after you start believing you are healed? Or why do our finances get a big blow to frighten you the moment you start trusting that God is your Provider? Why did the waves come against Peter on the sea and caused him to sink when he believed the Word Jesus spoke to him to come? You see, it is the same Devil, and he does not change this strategy against us, because it is working for him. We should be strong in faith, and not stagger in the Word. Take a moment and list the different steps of the physiology of faith mentioned above. Ask the Lord to grant you the grace to be strong in faith.